Holy crap. I just realized it's almost Christmas and I still haven't posted these Color Club glitters. I took these pictures BEFORE HALLOWEEN. Talk about backlog... I feel like I'll never be able to post all the things I want to post. Argh! Well, like I always say, better late than never. And there's no rule that says you can't wear green glitter after Christmas, so, there! Under The Mistletoe. Let's just start off with my favorite. Green glitter, any surprise it's the one I like the most? Didn't think so. This is not generally what I think of for a 'mistletoe' shade, but it's still nice! It's a light yellowy silver-green glitter. The base seems tinted, but the glitter is dense enough to cover the entire nail with no problem. Very very sparkly. Wonderland. Super sparkly light silver glitter. The picture speaks for itself. Uber-sparkly snowy silver glitter. Has a very bright reflective overall look. Not as dense as other silver glitters, this one would work well as a topcoat but it is dense enough to wear alone. Yule Love It. 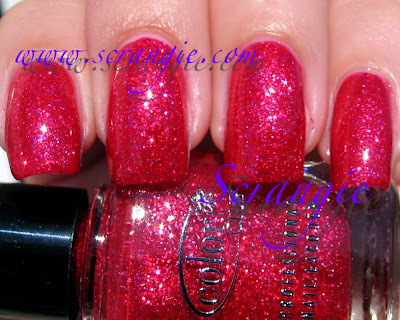 Light red glitter in a light red tinted/jellyish base. Again, not the traditional red glitter Ruby Pumps close. I like it! This is a very pinkish red shade, almost more of a deep magenta than a true red. The base isn't as sheer as I had expected it to be, it's more of a jelly finish than a sheer tint. Lovely. Does double duty as a great Valentine's Day color as well. Here's a quick indoor shot of them from the day I got them. That's Abracadabra on my middle finger. The formula on these was good. The glitter was nice and dense, I did three coats of all and that was good enough coverage for me to be happy. They're a little on the thick side. Drying time wasn't lightning fast, but not what I'd consider long. Average for Color Club, but faster than the Glitter Vixens. The glitter does have a little grit to it and needs a coat of a nice thick topcoat but they're also not as gritty as the Glitter Vixen ones were. These are more of a slight bumpy finish than a scratchy gritty finish. Yule Love It is actually quite smooth for a glitter. This set also comes with a clear topcoat- I haven't used it so I can't really judge the formula. Worth mentioning again, these are mini size, but they still have a decent sized brush. No stubby little OPI-Mini style brush. That's one thing I really like about Color Club minis, real brushes! And I just can't resist minis... they're too cute... Don't know what it is with me and mini things. Mini food, mini polish, mini perfumes... I'm just attracted to them like a magnet! It probably goes without saying that this little set makes me squeal like a schoolgirl. Throw some glitter at me and I'll be singing your praises forever. I'm a total glitter ho. I've been scared of glitter until i read about the aluminum foil trick for taking it off. Now i am starting to seek out glitter polishes! Crazy right?! I might pick these up with my next online order. I definitely love color club! Under the Mistletoe is my favorite of these too! They are all so cute though. Abracadabra is the best! And that's not part of the collection. But it's a GREAT polish. So pretty! I adore the look of the skittles nails - so cute! wonderful pictures! i wasn't sure about these before but now i want all of them! what's your favorite topcoat?! seche vite? sally hansen mega shine? LOVE the green glitter and the reddish/pink one too! I might go pick these up as a Merry Christmas present to me! i know this is kind of random, and maybe a little weird, but where did you come up with the name scrangie? I really love the skittles shot! Merry Christmas!